The Salisbury faculty know and understand young men, and celebrate what it means to be a boy! Salisbury provides young men with a quality academic program, nurturing environment, leadership opportunities, and a healthy social environment. 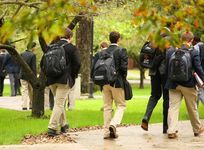 Salisbury instills in boys a vibrant enthusiasm for learning and the self-confidence needed for intellectual, physical, moral and spiritual development. Our dedicated faculty knows how boys learn and will help each boy to achieve success in his individual pursuits. Salisbury has a beautiful campus and is made for boys.. . .
One of the few all-male boarding schools remaining in New England, Salisbury School doesn't disappoint. This is the greatest aspect of the school. Having attended a coed boarding school prior, Salisbury was a completely different. . .
Salisbury School Boarding School Avg. The Salisbury faculty know and understand young men, and celebrate what it means to be a boy.As a school designed for boys, our emphasis on relational learning enables Salisbury faculty to build authentic relationships with each student.When a student feels known and valued, he is empowered to persevere through challenges and stay actively engaged.Our distinctive course offerings are carefully crafted to prepare students for the rigors of college and to think independently.The all-boys classroom nurtures the confidence to take risks and inspires growth.Numerous resources are available to guide students while accomplishing his goals and reaching his full potential. People that viewed Salisbury School also viewed these schools: Avon Old Farms School, Kent School, Berkshire School, Choate Rosemary Hall and The Hotchkiss School.